This article is about electronic amplifiers. For other uses, see Amplifier (disambiguation). An amplifier, electronic amplifier or (informally) amp is an electronic device that can increase the power of a signal (a time-varying voltage or current). An amplifier functions by taking power from a power supply and controlling the output to match the input signal shape but with a larger amplitude. In this sense, an amplifier modulates the output of the power supply based upon the properties of the input signal. An amplifier is effectively the opposite of an attenuator: while an amplifier provides gain, an attenuator provides loss. An amplifier can either be a discrete piece of equipment or an electrical circuit contained within another device. Amplification is fundamental to modern electronics, and amplifiers are widely used in almost all electronic equipment. Amplifiers can be categorized in different ways. One is by the frequency of the electronic signal being amplified; audio amplifiers amplify signals in the audio (sound) range of less than 20 kHz, RF amplifiers amplify frequencies in the radio frequency range between 20 kHz and 300 GHz. Another is which quantity, voltage or current is being amplified; amplifiers can be divided into voltage amplifiers, current amplifiers, transconductance amplifiers, and transresistance amplifiers. A further distinction is whether the output is a linear or nonlinear representation of the input. Amplifiers can also be categorized by their physical placement in the signal chain. The first practical electronic device that could amplify was the triode vacuum tube, invented in 1906 by Lee De Forest, which led to the first amplifiers around 1912. Vacuum tubes were used in almost all amplifiers until the 1960s - 1970s when the transistor invented in 1947 replaced them. Today most amplifiers use transistors, but vacuum tubes are still used in some applications. The development of audio communication technology; the telephone and intercom around 1880 and the first AM radio transmitters and receivers around 1905 created a need to somehow make an electrical audio signal "louder". Before the invention of electronic amplifiers, mechanically coupled carbon microphones were used as crude amplifiers in telephone repeaters. After the turn of the century it was found that negative resistance mercury lamps could amplify, and were also tried in repeaters. The first practical electronic device that could amplify was the Audion (triode) vacuum tube, invented in 1906 by Lee De Forest, which led to the first amplifiers around 1912. The terms "amplifier" and "amplification" (from the Latin amplificare, 'to enlarge or expand') were first used for this new capability around 1915 when triodes became widespread. The amplifying vacuum tube revolutionized electrical technology, creating the new field of electronics, the technology of active electrical devices. It made possible long distance telephone lines, public address systems, radio broadcasting, talking motion pictures, practical audio recording, radar, television, and the first computers. For 50 years virtually all consumer electronic devices used vacuum tubes. Early tube amplifiers often had positive feedback (regeneration), which could increase gain but also make the amplifier unstable and prone to oscillation. Much of the mathematical theory of amplifiers was developed at Bell Telephone Laboratories during the 1920s to 1940s. Distortion levels in early amplifiers were high, usually around 5%, until 1934, when Harold Black developed negative feedback; this allowed the distortion levels to be greatly reduced, at the cost of lower gain. Other advances in the theory of amplification were made by Harry Nyquist and Hendrik Wade Bode. The vacuum tube was the only amplifying device (besides specialized power devices such as the magnetic amplifier and amplidyne) for 40 years, and dominated electronics until 1947, when the first transistor, the BJT, was invented. The replacement of bulky, fragile vacuum tubes with transistors during the 1960s and 1970s created another revolution in electronics, making possible the first really portable electronic devices, such as the transistor radio developed in 1954. Today most amplifiers use transistors, but vacuum tubes are still used in some high power applications such as radio transmitters. Amplifiers are described according to the properties of their inputs, their outputs, and how they relate. All amplifiers have gain, a multiplication factor that relates the magnitude of some property of the output signal to a property of the input signal. The gain may be specified as the ratio of output voltage to input voltage (voltage gain), output power to input power (power gain), or some combination of current, voltage, and power. In many cases the property of the output that varies is dependent on the same property of the input, making the gain unitless (though often expressed in decibels (dB)). Most amplifiers are designed to be linear. That is, they provide constant gain for any normal input level and output signal. If an amplifier's gain is not linear, the output signal can become distorted. There are, however, cases where variable gain is useful. Certain signal processing applications use exponential gain amplifiers. Amplifiers are usually designed to function well in a specific application, for example: radio and television transmitters and receivers, high-fidelity ("hi-fi") stereo equipment, microcomputers and other digital equipment, and guitar and other instrument amplifiers. Every amplifier includes a least one active device, such as a vacuum tube or transistor. All amplifiers include some form of active device: this is the device that does the actual amplification. The active device can be a discrete component (like a single MOSFET) or part of an integrated circuit (as in an op-amp). Transistor amplifiers (or solid state amplifiers) are the most common type of amplifier in use today. A transistor is used as the active element. The gain of the amplifier is determined by the properties of the transistor itself as well as the circuit it is contained within. Common active devices in transistor amplifiers include bipolar junction transistors (BJTs) and metal oxide semiconductor field-effect transistors (MOSFETs). Applications are numerous, some common examples are audio amplifiers in a home stereo or PA system, RF high power generation for semiconductor equipment, to RF and microwave applications such as radio transmitters. Transistor-based amplification can be realized using various configurations: for example a bipolar junction transistor can realize common base, common collector or common emitter amplification; a MOSFET can realize common gate, common source or common drain amplification. Each configuration has different characteristics. Vacuum-tube amplifiers (also known as tube amplifiers or valve amplifiers) use a vacuum tube as the active device. While semiconductor amplifiers have largely displaced valve amplifiers for low power applications, valve amplifiers can be much more cost effective in high power applications such as radar, countermeasures equipment, and communications equipment. Many microwave amplifiers are specially designed valve amplifiers, such as the klystron, gyrotron, traveling wave tube, and crossed-field amplifier, and these microwave valves provide much greater single-device power output at microwave frequencies than solid-state devices. Tube amplifiers are also still used in some high end audio equipment, thanks to their reputation for producing a unique "tube sound". They have largely fallen out of use due to development in semiconductor amplifiers but are still useful in HVDC control, and in nuclear power control circuitry to their not being affected by radioactivity. Negative resistances can be used as amplifiers, such as the tunnel diode amplifier. Amplifiers can also be categorised by the way they amplify the input signal. A power amplifier is an amplifier designed primarily to increase the power available to a load. In practice, amplifier power gain depends on the source and load impedances, as well as the inherent voltage and current gain. A radio frequency (RF) amplifier design typically optimizes impedances for power transfer, while audio and instrumentation amplifier designs normally optimize input and output impedance for least loading and highest signal integrity. An amplifier that is said to have a gain of 20 dB might have a voltage gain of 20 dB and an available power gain of much more than 20 dB (power ratio of 100)—yet actually deliver a much lower power gain if, for example, the input is from a 600 ohm microphone and the output connects to a 47 kilohm input socket for a power amplifier. In general the power amplifier is the last 'amplifier' or actual circuit in a signal chain (the output stage) and is the amplifier stage that requires attention to power efficiency. Efficiency considerations lead to the various classes of power amplifier based on the biasing of the output transistors or tubes: see power amplifier classes below. An operational amplifier is an amplifier circuit which typically has very high open loop gain and differential inputs. Op amps have become very widely used as standardized "gain blocks" in circuits due to their versatility; their gain, bandwidth and other characteristics can be controlled by feedback through an external circuit. Though the term today commonly applies to integrated circuits, the original operational amplifier design used valves, and later designs used discrete transistor circuits. A fully differential amplifier is similar to the operational amplifier, but also has differential outputs. These are usually constructed using BJTs or FETs. These use balanced transmission lines to separate individual single stage amplifiers, the outputs of which are summed by the same transmission line. The transmission line is a balanced type with the input at one end and on one side only of the balanced transmission line and the output at the opposite end is also the opposite side of the balanced transmission line. The gain of each stage adds linearly to the output rather than multiplies one on the other as in a cascade configuration. This allows a higher bandwidth to be achieved than could otherwise be realised even with the same gain stage elements. These nonlinear amplifiers have much higher efficiencies than linear amps, and are used where the power saving justifies the extra complexity. Class-D amplifiers are the main example of this type of amplification—see below. Video amplifiers are designed to process video signals and have varying bandwidths depending on whether the video signal is for SDTV, EDTV, HDTV 720p or 1080i/p etc.. The specification of the bandwidth itself depends on what kind of filter is used—and at which point (-1 dB or -3 dB for example) the bandwidth is measured. Certain requirements for step response and overshoot are necessary for an acceptable TV image. These deal with video signals that drive an oscilloscope display tube, and can have bandwidths of about 500 MHz. The specifications on step response, rise time, overshoot, and aberrations can make designing these amplifiers difficult. One of the pioneers in high bandwidth vertical amplifiers was the Tektronix company. Traveling wave tube amplifiers (TWTAs) are used for high power amplification at low microwave frequencies. They typically can amplify across a broad spectrum of frequencies; however, they are usually not as tunable as klystrons. Klystrons are specialized linear-beam vacuum-devices, designed to provide high power, widely tunable amplification of millimetre and sub-millimetre waves. Klystrons are designed for large scale operations and despite having a narrower bandwidth than TWTAs, they have the advantage of coherently amplifying a reference signal so its output may be precisely controlled in amplitude, frequency and phase. Frequency response – not just the frequency range but the requirement that the signal level varies so little across the audible frequency range that the human ear notices no variation. A typical specification for audio amplifiers may be 20 Hz to 20 kHz +/- 0.5 dB. Power output – the power level obtainable with little distortion, to obtain a sufficiently loud sound pressure level from the loudspeakers. Low distortion – all amplifiers and transducers distort to some extent. They cannot be perfectly linear, but aim to pass signals without affecting the harmonic content of the sound more than the human ear can tolerate. That tolerance of distortion, and indeed the possibility that some "warmth" or second harmonic distortion (tube sound) improves the "musicality" of the sound, are subjects of great debate. Before coming onto the music scene, amplifiers were heavily used in cinema. In the premiere of Noah's Ark in 1929, the movie's director (Michael Kurtiz) used the amplifier for a festival following the movie's premiere. In practice the ideal impedances are not possible to achieve. For any particular circuit, a small-signal analysis is often used to find the actual impedance. A small-signal AC test current Ix is applied to the input or output node, all external sources are set to AC zero, and the corresponding alternating voltage Vx across the test current source determines the impedance seen at that node as R = Vx / Ix. Amplifiers designed to attach to a transmission line at input and output, especially RF amplifiers, do not fit into this classification approach. Rather than dealing with voltage or current individually, they ideally couple with an input or output impedance matched to the transmission line impedance, that is, match ratios of voltage to current. Many real RF amplifiers come close to this ideal. Although, for a given appropriate source and load impedance, RF amplifiers can be characterized as amplifying voltage or current, they fundamentally are amplifying power. One set of classifications for amplifiers is based on which device terminal is common to both the input and the output circuit. In the case of bipolar junction transistors, the three classes are common emitter, common base, and common collector. For field-effect transistors, the corresponding configurations are common source, common gate, and common drain; for vacuum tubes, common cathode, common grid, and common plate. The common emitter (or common source, common cathode, etc.) is most often configured to provide amplification of a voltage applied between base and emitter, and the output signal taken between collector and emitter is inverted, relative to the input. The common collector arrangement applies the input voltage between base and collector, and to take the output voltage between emitter and collector. This causes negative feedback, and the output voltage tends to follow the input voltage. This arrangement is also used as the input presents a high impedance and does not load the signal source, though the voltage amplification is less than one. The common-collector circuit is, therefore, better known as an emitter follower, source follower, or cathode follower. An amplifier whose output exhibits no feedback to its input side is described as 'unilateral'. The input impedance of a unilateral amplifier is independent of load, and output impedance is independent of signal source impedance. An amplifier that uses feedback to connect part of the output back to the input is a bilateral amplifier. Bilateral amplifier input impedance depends on the load, and output impedance on the signal source impedance. All amplifiers are bilateral to some degree; however they may often be modeled as unilateral under operating conditions where feedback is small enough to neglect for most purposes, simplifying analysis (see the common base article for an example). An amplifier design often deliberately applies negative feedback to tailor amplifier behavior. Some feedback, positive or negative, is unavoidable and often undesirable—introduced, for example, by parasitic elements, such as inherent capacitance between input and output of devices such as transistors, and capacitive coupling of external wiring. Excessive frequency-dependent positive feedback can turn an amplifier into an oscillator. Linear unilateral and bilateral amplifiers can be represented as two-port networks. Another way to classify amplifiers is by the phase relationship of the input signal to the output signal. An 'inverting' amplifier produces an output 180 degrees out of phase with the input signal (that is, a polarity inversion or mirror image of the input as seen on an oscilloscope). A 'non-inverting' amplifier maintains the phase of the input signal waveforms. An emitter follower is a type of non-inverting amplifier, indicating that the signal at the emitter of a transistor is following (that is, matching with unity gain but perhaps an offset) the input signal. Voltage follower is also non inverting type of amplifier having unity gain. A linear amplifier responds to different frequency components independently, and does not generate harmonic distortion or Intermodulation distortion. No amplifier can provide perfect linearity (even the most linear amplifier has some nonlinearities, since the amplifying devices—transistors or vacuum tubes—follow nonlinear power laws such as square-laws and rely on circuitry techniques to reduce those effects). a device like a Silicon Controlled Rectifier or a transistor used as a switch may be employed to turn either fully ON or OFF a load such as a lamp based on a threshold in a continuously variable input. a non-linear amplifier in an analog computer or true RMS converter for example can provide a special transfer function, such as logarithmic or square-law. a Class C RF amplifier may be chosen because it can be very efficient—but is non-linear. Following such an amplifier with a "tank" tuned circuit can reduce unwanted harmonics (distortion) sufficiently to make it useful in transmitters, or some desired harmonic may be selected by setting the resonant frequency of the tuned circuit to a higher frequency rather than fundamental frequency in frequency multiplier circuits. Automatic gain control circuits require an amplifier's gain be controlled by the time-averaged amplitude so that the output amplitude varies little when weak stations are being received. The non-linearities are assumed arranged so the relatively small signal amplitude suffers from little distortion (cross-channel interference or intermodulation) yet is still modulated by the relatively large gain-control DC voltage. AM detector circuits that use amplification such as Anode-bend detectors, Precision rectifiers and Infinite impedance detectors (so excluding unamplified detectors such as Cat's-whisker detectors), as well as peak detector circuits, rely on changes in amplification based on the signal's instantaneous amplitude to derive a direct current from an alternating current input. Operational amplifier comparator and detector circuits. A wideband amplifier has a precise amplification factor over a wide frequency range, and is often used to boost signals for relay in communications systems. A narrowband amp amplifies a specific narrow range of frequencies, to the exclusion of other frequencies. An RF amplifier amplifies signals in the radio frequency range of the electromagnetic spectrum, and is often used to increase the sensitivity of a receiver or the output power of a transmitter. Preamplifier (preamp), which may include a phono preamp with RIAA equalization, or tape head preamps with CCIR equalisation filters. They may include filters or tone control circuitry. Power amplifier (normally drives loudspeakers), headphone amplifiers, and public address amplifiers. Stereo amplifiers imply two channels of output (left and right), though the term simply means "solid" sound (referring to three-dimensional)—so quadraphonic stereo was used for amplifiers with four channels. 5.1 and 7.1 systems refer to Home theatre systems with 5 or 7 normal spatial channels, plus a subwoofer channel. Buffer amplifiers, which may include emitter followers, provide a high impedance input for a device (perhaps another amplifier, or perhaps an energy-hungry load such as lights) that would otherwise draw too much current from the source. Line drivers are a type of buffer that feeds long or interference-prone interconnect cables, possibly with differential outputs through twisted pair cables. The performance of an op-amp with these characteristics is entirely defined by the (usually passive) components that form a negative feedback loop around it. The amplifier itself does not affect the output. All real-world op-amps fall short of the idealised specification above—but some modern components have remarkable performance and come close in some respects. By design these amplifiers cannot amplify DC signals as the capacitors block the DC component of the input signal. RC-coupled amplifiers were used very often in circuits with vacuum tubes or discrete transistors. In the days of the integrated circuit a few more transistors on a chip are much cheaper and smaller than a capacitor. This kind of amplifier is most often used in selective radio-frequency circuits. Quite often LC-coupled and transformer-coupled amplifiers cannot be distinguished as a transformer is some kind of inductor. This class of amplifier was very uncommon in the vacuum tube days when the anode (output) voltage was at greater than several hundred volts and the grid (input) voltage at a few volts minus. So they were only used if the gain was specified down to DC (e.g., in an oscilloscope). In the context of modern electronics developers are encouraged to use directly coupled amplifiers whenever possible. In FET and CMOS technologies direct coupling is dominant since gates of MOSFETs theoretically pass no current through themselves. Therefore, DC component of the input signals is automatically filtered. Frequency ranges down to DC are only used when this property is needed. DC amplification leads to specific complications that are avoided if possible; DC-blocking capacitors can be added to remove DC and sub-sonic frequencies from audio amplifiers. Depending on the frequency range specified different design principles must be used. Up to the MHz range only "discrete" properties need be considered; e.g., a terminal has an input impedance. As soon as any connection within the circuit gets longer than perhaps 1% of the wavelength of the highest specified frequency (e.g., at 100 MHz the wavelength is 3 m, so the critical connection length is approx. 3 cm) design properties radically change. For example, a specified length and width of a PCB trace can be used as a selective or impedance-matching entity. Above a few hundred MHz, it gets difficult to use discrete elements, especially inductors. In most cases, PCB traces of very closely defined shapes are used instead. The frequency range handled by an amplifier might be specified in terms of bandwidth (normally implying a response that is 3 dB down when the frequency reaches the specified bandwidth), or by specifying a frequency response that is within a certain number of decibels between a lower and an upper frequency (e.g. "20 Hz to 20 kHz plus or minus 1 dB"). Power amplifier circuits (output stages) are classified as A, B, AB and C for analog designs—and class D and E for switching designs—based on the proportion of each input cycle (conduction angle) during which an amplifying device passes current. The image of the conduction angle derives from amplifying a sinusoidal signal. If the device is always on, the conducting angle is 360°. If it is on for only half of each cycle, the angle is 180°. The angle of flow is closely related to the amplifier power efficiency. The various classes are introduced below, followed by a more detailed discussion under their individual headings further down. In the illustrations below, a bipolar junction transistor is shown as the amplifying device. However the same attributes are found with MOSFETs or vacuum tubes. 100% of the input signal is used (conduction angle Θ = 360°). The active element remains conducting all of the time. 50% of the input signal is used (Θ = 180°); the active element carries current half of each cycle, and is turned off for the other half. Class AB is intermediate between class A and B, the two active elements conduct more than half of the time. Less than 50% of the input signal is used (conduction angle Θ < 180°). A "Class D" amplifier uses some form of pulse-width modulation to control the output devices; the conduction angle of each device is no longer related directly to the input signal but instead varies in pulse width. These are sometimes called "digital" amplifiers because the output device is switched fully on or off, and not carrying current proportional to the signal amplitude. There are several other amplifier classes, although they are mainly variations of the previous classes. For example, class-G and class-H amplifiers are marked by variation of the supply rails (in discrete steps or in a continuous fashion, respectively) following the input signal. Wasted heat on the output devices can be reduced as excess voltage is kept to a minimum. The amplifier that is fed with these rails itself can be of any class. These kinds of amplifiers are more complex, and are mainly used for specialized applications, such as very high-power units. Also, class-E and class-F amplifiers are commonly described in literature for radio-frequency applications where efficiency of the traditional classes is important, yet several aspects deviate substantially from their ideal values. These classes use harmonic tuning of their output networks to achieve higher efficiency and can be considered a subset of class C due to their conduction-angle characteristics. Amplifying devices operating in class A conduct over the entire range of the input cycle. A class-A amplifier is distinguished by the output stage devices being biased for class A operation. Subclass A2 is sometimes used to refer to vacuum-tube class-A stages that drive the grid slightly positive on signal peaks for slightly more power than normal class A (A1; where the grid is always negative). This, however, incurs higher signal distortion. Class-A designs are simpler than other classes; for example class -AB and -B designs require two connected devices in the circuit (push–pull output), each to handle one half of the waveform; class A can use a single device (single-ended). The amplifying element is biased so the device is always conducting, the quiescent (small-signal) collector current (for transistors; drain current for FETs or anode/plate current for vacuum tubes) is close to the most linear portion of its transconductance curve. Because the device is never 'off' there is no "turn on" time, no problems with charge storage, and generally better high frequency performance and feedback loop stability (and usually fewer high-order harmonics). The point where the device comes closest to being 'off' is not at 'zero signal', so the problems of crossover distortion associated with class-AB and -B designs is avoided. Best for low signal levels of radio receivers due to low distortion. Class-A amplifiers are inefficient. A theoretical efficiency of 50% is obtainable in a push-pull topology, and only 25% in a single-ended topology, unless deliberate use of nonlinearities is made (such as in square-law output stages). In a power amplifier, this not only wastes power and limits operation with batteries, but increases operating costs and requires higher-rated output devices. Inefficiency comes from the standing current that must be roughly half the maximum output current, and a large part of the power supply voltage is present across the output device at low signal levels. If high output power is needed from a class-A circuit, the power supply and accompanying heat becomes significant. For every watt delivered to the load, the amplifier itself, at best, uses an extra watt. For high power amplifiers this means very large and expensive power supplies and heat sinks. Class-A power amplifier designs have largely been superseded by more efficient designs, though their simplicity makes them popular with some hobbyists. There is a market for expensive high fidelity class-A amps considered a "cult item" among audiophiles mainly for their absence of crossover distortion and reduced odd-harmonic and high-order harmonic distortion. They also fill a niche market for recreations of vintage guitar amplifiers, due to their unique tone. Single-ended output stages have an asymmetrical transfer function, meaning that even-order harmonics in the created distortion tend to not cancel out (as they do in push–pull output stages). For tubes, or FETs, most distortion is second-order harmonics, from the square law transfer characteristic, which to some produces a "warmer" and more pleasant sound. For those who prefer low distortion figures, the use of tubes with class A (generating little odd-harmonic distortion, as mentioned above) together with symmetrical circuits (such as push–pull output stages, or balanced low-level stages) results in the cancellation of most of the even distortion harmonics, hence the removal of most of the distortion. Historically, valve amplifiers often used a class-A power amplifier simply because valves are large and expensive; many class-A designs use only a single device. Transistors are much cheaper, and so more elaborate designs that give greater efficiency but use more parts are still cost-effective. A classic application for a pair of class-A devices is the long-tailed pair, which is exceptionally linear, and forms the basis of many more complex circuits, including many audio amplifiers and almost all op-amps. Class-A amplifiers may be used in output stages of op-amps (although the accuracy of the bias in low cost op-amps such as the 741 may result in class A or class AB or class B performance, varying from device to device or with temperature). They are sometimes used as medium-power, low-efficiency, and high-cost audio power amplifiers. The power consumption is unrelated to the output power. At idle (no input), the power consumption is essentially the same as at high output volume. The result is low efficiency and high heat dissipation. Class-B amplifiers only amplify half of the input wave cycle, thus creating a large amount of distortion, but their efficiency is greatly improved and is much better than class A. Class-B amplifiers are also favoured in battery-operated devices, such as transistor radios. Class B has a maximum theoretical efficiency of π/4 (≈ 78.5%). This is because the amplifying element is switched off altogether half of the time, and so cannot dissipate power. A single class-B element is rarely found in practice, though it has been used for driving the loudspeaker in the early IBM Personal Computers with beeps, and it can be used in RF power amplifier where the distortion levels are less important. However, class C is more commonly used for this. A practical circuit using class-B elements is the push–pull stage, such as the very simplified complementary pair arrangement shown below. Here, complementary or quasi-complementary devices are each used for amplifying the opposite halves of the input signal, which is then recombined at the output. This arrangement gives excellent efficiency, but can suffer from the drawback that there is a small mismatch in the cross-over region – at the "joins" between the two halves of the signal, as one output device has to take over supplying power exactly as the other finishes. This is called crossover distortion. An improvement is to bias the devices so they are not completely off when they are not in use. This approach is called class AB operation. Class B amplifiers offer higher efficiency than class A amplifier using a single active device. Class AB is widely considered a good compromise for amplifiers, since much of the time the music signal is quiet enough that the signal stays in the "class A" region, where it is amplified with good fidelity, and by definition if passing out of this region, is large enough that the distortion products typical of class B are relatively small. The crossover distortion can be reduced further by using negative feedback. In class-AB operation, each device operates the same way as in class B over half the waveform, but also conducts a small amount on the other half. As a result, the region where both devices simultaneously are nearly off (the "dead zone") is reduced. The result is that when the waveforms from the two devices are combined, the crossover is greatly minimised or eliminated altogether. The exact choice of quiescent current (the standing current through both devices when there is no signal) makes a large difference to the level of distortion (and to the risk of thermal runaway, that may damage the devices). Often, bias voltage applied to set this quiescent current must be adjusted with the temperature of the output transistors. (For example, in the circuit at the beginning of the article, the diodes would be mounted physically close to the output transistors, and specified to have a matched temperature coefficient.) Another approach (often used with thermally tracking bias voltages) is to include small value resistors in series with the emitters. Class AB sacrifices some efficiency over class B in favor of linearity, thus is less efficient (below 78.5% for full-amplitude sinewaves in transistor amplifiers, typically; much less is common in class-AB vacuum-tube amplifiers). It is typically much more efficient than class A. Sometimes a numeral is added for vacuum-tube stages. If grid current is not permitted to flow, the class is AB1. If grid current is allowed to flow (adding more distortion, but giving slightly higher output power) the class is AB2. Class-C amplifiers conduct less than 50% of the input signal and the distortion at the output is high, but high efficiencies (up to 90%) are possible. The usual application for class-C amplifiers is in RF transmitters operating at a single fixed carrier frequency, where the distortion is controlled by a tuned load on the amplifier. The input signal is used to switch the active device causing pulses of current to flow through a tuned circuit forming part of the load. The class-C amplifier has two modes of operation: tuned and untuned. The diagram shows a waveform from a simple class-C circuit without the tuned load. This is called untuned operation, and the analysis of the waveforms shows the massive distortion that appears in the signal. When the proper load (e.g., an inductive-capacitive filter plus a load resistor) is used, two things happen. The first is that the output's bias level is clamped with the average output voltage equal to the supply voltage. This is why tuned operation is sometimes called a clamper. This restores the waveform to its proper shape, despite the amplifier having only a one-polarity supply. This is directly related to the second phenomenon: the waveform on the center frequency becomes less distorted. The residual distortion is dependent upon the bandwidth of the tuned load, with the center frequency seeing very little distortion, but greater attenuation the farther from the tuned frequency that the signal gets. The tuned circuit resonates at one frequency, the fixed carrier frequency, and so the unwanted frequencies are suppressed, and the wanted full signal (sine wave) is extracted by the tuned load. The signal bandwidth of the amplifier is limited by the Q-factor of the tuned circuit but this is not a serious limitation. Any residual harmonics can be removed using a further filter. In practical class-C amplifiers a tuned load is invariably used. In one common arrangement the resistor shown in the circuit above is replaced with a parallel-tuned circuit consisting of an inductor and capacitor in parallel, whose components are chosen to resonate the frequency of the input signal. Power can be coupled to a load by transformer action with a secondary coil wound on the inductor. The average voltage at the collector is then equal to the supply voltage, and the signal voltage appearing across the tuned circuit varies from near zero to near twice the supply voltage during the RF cycle. The input circuit is biased so that the active element (e.g., transistor) conducts for only a fraction of the RF cycle, usually one third (120 degrees) or less. The active element conducts only while the collector voltage is passing through its minimum. By this means, power dissipation in the active device is minimised, and efficiency increased. Ideally, the active element would pass only an instantaneous current pulse while the voltage across it is zero: it then dissipates no power and 100% efficiency is achieved. However practical devices have a limit to the peak current they can pass, and the pulse must therefore be widened, to around 120 degrees, to obtain a reasonable amount of power, and the efficiency is then 60–70%. Block diagram of a basic switching or PWM (class-D) amplifier. In the class-D amplifier the active devices (transistors) function as electronic switches instead of linear gain devices; they are either on or off. The analog signal is converted to a stream of pulses that represents the signal by pulse-width modulation, pulse-density modulation, delta-sigma modulation or a related modulation technique before being applied to the amplifier. The time average power value of the pulses is directly proportional to the analog signal, so after amplification the signal can be converted back to an analog signal by a passive low-pass filter. The purpose of the output filter is to smooth the pulse stream to an analog signal, removing the high frequency spectral components of the pulses. The frequency of the output pulses is typically ten or more times the highest frequency in the input signal to amplify, so that the filter can adequately reduce the unwanted harmonics and accurately reproduce the input. The main advantage of a class-D amplifier is power efficiency. Because the output pulses have a fixed amplitude, the switching elements (usually MOSFETs, but vacuum tubes, and at one time bipolar transistors, were used) are switched either completely on or completely off, rather than operated in linear mode. A MOSFET operates with the lowest resistance when fully on and thus (excluding when fully off) has the lowest power dissipation when in that condition. Compared to an equivalent class-AB device, a class-D amplifier's lower losses permit the use of a smaller heat sink for the MOSFETs while also reducing the amount of input power required, allowing for a lower-capacity power supply design. Therefore, class-D amplifiers are typically smaller than an equivalent class-AB amplifier. Another advantage of the class-D amplifier is that it can operate from a digital signal source without requiring a digital-to-analog converter (DAC) to convert the signal to analog form first. If the signal source is in digital form, such as in a digital media player or computer sound card, the digital circuitry can convert the binary digital signal directly to a pulse-width modulation signal that is applied to the amplifier, simplifying the circuitry considerably. Class-D amplifiers are widely used to control motors—but are now also used as power amplifiers, with extra circuitry that converts analogue to a much higher frequency pulse width modulated signal. Switching power supplies have even been modified into crude class-D amplifiers (though typically these only reproduce low-frequencies with acceptable accuracy). High quality class-D audio power amplifiers have now appeared on the market. These designs have been said to rival traditional AB amplifiers in terms of quality. An early use of class-D amplifiers was high-power subwoofer amplifiers in cars. Because subwoofers are generally limited to a bandwidth of no higher than 150 Hz, switching speed for the amplifier does not have to be as high as for a full range amplifier, allowing simpler designs. Class-D amplifiers for driving subwoofers are relatively inexpensive in comparison to class-AB amplifiers. The class-E/F amplifier is a highly efficient switching power amplifier, typically used at such high frequencies that the switching time becomes comparable to the duty time. As said in the class-D amplifier, the transistor is connected via a serial LC circuit to the load, and connected via a large L (inductor) to the supply voltage. The supply voltage is connected to ground via a large capacitor to prevent any RF signals leaking into the supply. The class-E amplifier adds a C (capacitor) between the transistor and ground and uses a defined L1 to connect to the supply voltage. The following description ignores DC, which can be added easily afterwards. The above-mentioned C and L are in effect a parallel LC circuit to ground. When the transistor is on, it pushes through the serial LC circuit into the load and some current begins to flow to the parallel LC circuit to ground. Then the serial LC circuit swings back and compensates the current into the parallel LC circuit. At this point the current through the transistor is zero and it is switched off. Both LC circuits are now filled with energy in C and L0. The whole circuit performs a damped oscillation. The damping by the load has been adjusted so that some time later the energy from the Ls is gone into the load, but the energy in both C0 peaks at the original value to in turn restore the original voltage so that the voltage across the transistor is zero again and it can be switched on. With load, frequency, and duty cycle (0.5) as given parameters and the constraint that the voltage is not only restored, but peaks at the original voltage, the four parameters (L, L0, C and C0) are determined. The class-E amplifier takes the finite on resistance into account and tries to make the current touch the bottom at zero. This means that the voltage and the current at the transistor are symmetric with respect to time. The Fourier transform allows an elegant formulation to generate the complicated LC networks and says that the first harmonic is passed into the load, all even harmonics are shorted and all higher odd harmonics are open. Class E uses a significant amount of second-harmonic voltage. The second harmonic can be used to reduce the overlap with edges with finite sharpness. For this to work, energy on the second harmonic has to flow from the load into the transistor, and no source for this is visible in the circuit diagram. In reality, the impedance is mostly reactive and the only reason for it is that class E is a class F (see below) amplifier with a much simplified load network and thus has to deal with imperfections. In many amateur simulations of class-E amplifiers, sharp current edges are assumed nullifying the very motivation for class E and measurements near the transit frequency of the transistors show very symmetric curves, which look much similar to class-F simulations. The class-E amplifier was invented in 1972 by Nathan O. Sokal and Alan D. Sokal, and details were first published in 1975. Some earlier reports on this operating class have been published in Russian and Polish. In push–pull amplifiers and in CMOS, the even harmonics of both transistors just cancel. Experiment shows that a square wave can be generated by those amplifiers. Theoretically square waves consist of odd harmonics only. In a class-D amplifier, the output filter blocks all harmonics; i.e., the harmonics see an open load. So even small currents in the harmonics suffice to generate a voltage square wave. The current is in phase with the voltage applied to the filter, but the voltage across the transistors is out of phase. Therefore, there is a minimal overlap between current through the transistors and voltage across the transistors. The sharper the edges, the lower the overlap. While in class D, transistors and the load exist as two separate modules, class F admits imperfections like the parasitics of the transistor and tries to optimise the global system to have a high impedance at the harmonics. Of course there must be a finite voltage across the transistor to push the current across the on-state resistance. Because the combined current through both transistors is mostly in the first harmonic, it looks like a sine. That means that in the middle of the square the maximum of current has to flow, so it may make sense to have a dip in the square or in other words to allow some overswing of the voltage square wave. A class-F load network by definition has to transmit below a cutoff frequency and reflect above. Any frequency lying below the cutoff and having its second harmonic above the cutoff can be amplified, that is an octave bandwidth. On the other hand, an inductive-capacitive series circuit with a large inductance and a tunable capacitance may be simpler to implement. By reducing the duty cycle below 0.5, the output amplitude can be modulated. The voltage square waveform degrades, but any overheating is compensated by the lower overall power flowing. Any load mismatch behind the filter can only act on the first harmonic current waveform, clearly only a purely resistive load makes sense, then the lower the resistance, the higher the current. Class F can be driven by sine or by a square wave, for a sine the input can be tuned by an inductor to increase gain. If class F is implemented with a single transistor, the filter is complicated to short the even harmonics. All previous designs use sharp edges to minimise the overlap. There is a variety of amplifier designs that enhance class-AB output stages with more efficient techniques to achieve greater efficiency with low distortion. These designs are common in large audio amplifiers since the heatsinks and power transformers would be prohibitively large (and costly) without the efficiency increases. The terms "class G" and "class H" are used interchangeably to refer to different designs, varying in definition from one manufacturer or paper to another. Class-G amplifiers (which use "rail switching" to decrease power consumption and increase efficiency) are more efficient than class-AB amplifiers. These amplifiers provide several power rails at different voltages and switch between them as the signal output approaches each level. Thus, the amplifier increases efficiency by reducing the wasted power at the output transistors. Class-G amplifiers are more efficient than class AB but less efficient when compared to class D, however, they do not have the electromagnetic interference effects of class D.
Class-H amplifiers take the idea of class G one step further creating an infinitely variable supply rail. This is done by modulating the supply rails so that the rails are only a few volts larger than the output signal at any given time. The output stage operates at its maximum efficiency all the time. Switched-mode power supplies can be used to create the tracking rails. Significant efficiency gains can be achieved but with the drawback of more complicated supply design and reduced THD performance. In common designs, a voltage drop of about 10V is maintained over the output transistors in Class H circuits. The picture above shows positive supply voltage of the output stage and the voltage at the speaker output. The boost of the supply voltage is shown for a real music signal. The voltage signal shown is thus a larger version of the input, but has been changed in sign (inverted) by the amplification. Other arrangements of amplifying device are possible, but that given (that is, common emitter, common source or common cathode) is the easiest to understand and employ in practice. If the amplifying element is linear, the output is a faithful copy of the input, only larger and inverted. In practice, transistors are not linear, and the output only approximates the input. nonlinearity from any of several sources is the origin of distortion within an amplifier. The class of amplifier (A, B, AB or C) depends on how the amplifying device is biased. The diagrams omit the bias circuits for clarity. Any real amplifier is an imperfect realization of an ideal amplifier. An important limitation of a real amplifier is that the output it generates is ultimately limited by the power available from the power supply. An amplifier saturates and clips the output if the input signal becomes too large for the amplifier to reproduce or exceeds operational limits for the device. The Doherty amplifier is a hybrid configuration. It was invented in 1934 by William H. Doherty for Bell Laboratories—whose sister company, Western Electric, manufactured radio transmitters. The Doherty amplifier consists of a class-B primary or carrier stages in parallel with a class-C auxiliary or peak stage. The input signal splits to drive the two amplifiers, and a combining network sums the two output signals. Phase shifting networks are used in inputs and outputs. During periods of low signal level, the class-B amplifier efficiently operates on the signal and the class-C amplifier is cutoff and consumes little power. During periods of high signal level, the class-B amplifier delivers its maximum power and the class-C amplifier delivers up to its maximum power. The efficiency of previous AM transmitter designs was proportional to modulation but, with average modulation typically around 20%, transmitters were limited to less than 50% efficiency. In Doherty's design, even with zero modulation, a transmitter could achieve at least 60% efficiency. As a successor to Western Electric for broadcast transmitters, the Doherty concept was considerably refined by Continental Electronics Manufacturing Company of Dallas, TX. Perhaps, the ultimate refinement was the screen-grid modulation scheme invented by Joseph B. Sainton. The Sainton amplifier consists of a class-C primary or carrier stage in parallel with a class-C auxiliary or peak stage. The stages are split and combined through 90-degree phase shifting networks as in the Doherty amplifier. The unmodulated radio frequency carrier is applied to the control grids of both tubes. Carrier modulation is applied to the screen grids of both tubes. The bias point of the carrier and peak tubes is different, and is established such that the peak tube is cutoff when modulation is absent (and the amplifier is producing rated unmodulated carrier power) whereas both tubes contribute twice the rated carrier power during 100% modulation (as four times the carrier power is required to achieve 100% modulation). As both tubes operate in class C, a significant improvement in efficiency is thereby achieved in the final stage. In addition, as the tetrode carrier and peak tubes require very little drive power, a significant improvement in efficiency within the driver stage is achieved as well (317C, et al.). The released version of the Sainton amplifier employs a cathode-follower modulator, not a push–pull modulator. Previous Continental Electronics designs, by James O. Weldon and others, retained most of the characteristics of the Doherty amplifier but added screen-grid modulation of the driver (317B, et al.). The Doherty amplifier remains in use in very-high-power AM transmitters, but for lower-power AM transmitters, vacuum-tube amplifiers in general were eclipsed in the 1980s by arrays of solid-state amplifiers, which could be switched on and off with much finer granularity in response to the requirements of the input audio. However, interest in the Doherty configuration has been revived by cellular-telephone and wireless-Internet applications where the sum of several constant envelope users creates an aggregate AM result. The main challenge of the Doherty amplifier for digital transmission modes is in aligning the two stages and getting the class-C amplifier to turn on and off very quickly. Recently, Doherty amplifiers have found widespread use in cellular base station transmitters for GHz frequencies. Implementations for transmitters in mobile devices have also been demonstrated. The first active elements were relays. They were for example used in transcontinental telegraph lines: a weak current was used to switch the voltage of a battery to the outgoing line. For transmitting audio, carbon microphones were used as the active element. 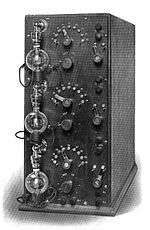 This was used to modulate a radio-frequency source in one of the first AM audio transmissions, by Reginald Fessenden on Dec. 24, 1906. Power control circuitry used magnetic amplifiers until the latter half of the twentieth century when high power FETs, and their easy interfacing to the newly developed digital circuitry, took over. Audio and most low power amplifiers used vacuum tubes exclusively until the 1960s. Today, tubes are used for specialist audio applications such as guitar amplifiers and audiophile amplifiers. 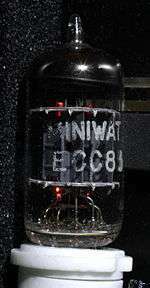 Many broadcast transmitters still use vacuum tubes. In the 1960s, the transistor started to take over. These days, discrete transistors are still used in high-power amplifiers and in specialist audio devices. 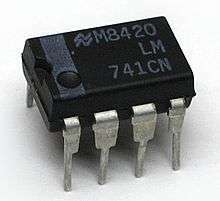 Beginning in the 1970s, more and more transistors were connected on a single chip therefore creating the integrated circuit. A large number of amplifiers commercially available today are based on integrated circuits. For special purposes, other active elements have been used. For example, in the early days of the satellite communication, parametric amplifiers were used. The core circuit was a diode whose capacitance was changed by an RF signal created locally. Under certain conditions, this RF signal provided energy that was modulated by the extremely weak satellite signal received at the earth station. The practical amplifier circuit to the right could be the basis for a moderate-power audio amplifier. It features a typical (though substantially simplified) design as found in modern amplifiers, with a class-AB push–pull output stage, and uses some overall negative feedback. Bipolar transistors are shown, but this design would also be realizable with FETs or valves. The negative feedback into the difference amplifier allows the amplifier to compare the input to the actual output. The amplified signal from Q1 is directly fed to the second stage, Q3, which is a common emitter stage that provides further amplification of the signal and the DC bias for the output stages, Q4 and Q5. R6 provides the load for Q3 (a better design would probably use some form of active load here, such as a constant-current sink). So far, all of the amplifier is operating in class A. The output pair are arranged in class-AB push–pull, also called a complementary pair. They provide the majority of the current amplification (while consuming low quiescent current) and directly drive the load, connected via DC-blocking capacitor C2. The diodes D1 and D2 provide a small amount of constant voltage bias for the output pair, just biasing them into the conducting state so that crossover distortion is minimized. That is, the diodes push the output stage firmly into class-AB mode (assuming that the base-emitter drop of the output transistors is reduced by heat dissipation). This design is simple, but a good basis for a practical design because it automatically stabilises its operating point, since feedback internally operates from DC up through the audio range and beyond. Further circuit elements would probably be found in a real design that would roll-off the frequency response above the needed range to prevent the possibility of unwanted oscillation. Also, the use of fixed diode bias as shown here can cause problems if the diodes are not both electrically and thermally matched to the output transistors – if the output transistors turn on too much, they can easily overheat and destroy themselves, as the full current from the power supply is not limited at this stage. A common solution to help stabilise the output devices is to include some emitter resistors, typically one ohm or so. Calculating the values of the circuit's resistors and capacitors is done based on the components employed and the intended use of the amp. A Cascode amplifier is a two-stage circuit consisting of a transconductance amplifier followed by a buffer amplifier. A Log amplifier is a linear circuit in which output voltage is a constant times the natural logarithm of input. Real world amplifiers are imperfect. The power supply may influence the output, so must be considered in the design. A power amplifier is effectively an input signal controlled power regulator. It regulates the power sourced from the power supply or mains to the amplifier's load. The power output from a power amplifier cannot exceed the power input to it. The amplifier circuit has an "open loop" performance. This is described by various parameters (gain, slew rate, output impedance, distortion, bandwidth, signal to noise ratio, etc.). Many modern amplifiers use negative feedback techniques to hold the gain at the desired value and reduce distortion. Negative loop feedback has the intended effect of electrically damping loudspeaker motion, thereby damping the mechanical dynamic performance of the loudspeaker. When assessing rated amplifier power output, it is useful to consider the applied load, the signal type (e.g., speech or music), required power output duration (i.e., short-time or continuous), and required dynamic range (e.g., recorded or live audio). In high-powered audio applications that require long cables to the load (e.g., cinemas and shopping centres) it may be more efficient to connect to the load at line output voltage, with matching transformers at source and loads. This avoids long runs of heavy speaker cables. Prevent instability or overheating requires care to ensure solid state amplifiers are adequately loaded. Most have a rated minimum load impedance. A summing circuit is typical in applications that must combine many inputs or channels to form a composite output. It is best to combine multiple channels for this. All amplifiers generate heat through electrical losses. The amplifier must dissipate this heat via convection or forced air cooling. Heat can damage or reduce electronic component service life. Designers and installers must also consider heating effects on adjacent equipment. Different power supply types result in many different methods of bias. Bias is a technique by which active devices are set to operate in a particular region, or by which the DC component of the output signal is set to the midpoint between the maximum voltages available from the power supply. Most amplifiers use several devices at each stage; they are typically matched in specifications except for polarity. Matched inverted polarity devices are called complementary pairs. Class-A amplifiers generally use only one device, unless the power supply is set to provide both positive and negative voltages, in which case a dual device symmetrical design may be used. Class-C amplifiers, by definition, use a single polarity supply. Amplifiers often have multiple stages in cascade to increase gain. Each stage of these designs may be a different type of amp to suit the needs of that stage. For instance, the first stage might be a class-A stage, feeding a class-AB push–pull second stage, which then drives a class-G final output stage, taking advantage of the strengths of each type, while minimizing their weaknesses. 1 2 3 Patronis, Gene (1987). "Amplifiers". In Glen Ballou. Handbook for Sound Engineers: The New Audio Cyclopedia. Howard W. Sams & Co. p. 493. ISBN 0-672-21983-2. ↑ Sungook, Hong (2001). Wireless: From Marconi's Black-Box to the Audion. MIT Press. p. 165. ISBN 0262082985. 1 2 Harper, Douglas (2001). "Amplify". Online Etymology Dictionary. Etymonline.com. Retrieved July 10, 2015. ↑ Robert S. Symons (1998). "Tubes: Still vital after all these years". IEEE Spectrum. 35 (4): 52–63. doi:10.1109/6.666962. ↑ Mammano, Bob (2001). "Magnetic Amplifier Control for Simple, Low-Cost, Secondary Regulation" (PDF). Texas Instruments. ↑ "Negative Resistance Revived". users.tpg.com.au. Retrieved 2016-06-20. ↑ Munsterman, G.T. (June 1965). "Tunnel-Diode Microwave Amplifiers" (PDF). APL Technical Digest. 4: 2–10. ↑ "What is a video amplifier, video booster amplifiers - Future Electronics". www.futureelectronics.com. Retrieved 2016-06-20. ↑ Orwiler, Bob (December 1969). "Vertical Amplifier Circuits" (PDF). Tektronix, Inc.
↑ "Travelling Wave Tube Amplifiers". www.r-type.org. Retrieved 2016-06-20. ↑ Rood, George. "Music Concerns Seek New Volume With Amplifier". New York Times. Retrieved 23 February 2015. ↑ "Amplifier Fills Need in Picture: Loud Speaker Only Method Found to Carry Directions During Turmoil". Los Angeles Times. ↑ This table is a "Zwicky box"; in particular, it encompasses all possibilities. See Fritz Zwicky. ↑ "Small signal analysis of Complex amplifier circuits". www.eeherald.com. Retrieved 2016-06-20. ↑ Administrator. "Microwaves101 | Active Directivity of Amplifiers". www.microwaves101.com. Retrieved 2016-06-20. ↑ Roy, Apratim; Rashid, S. M. S. (5 June 2012). "A power efficient bandwidth regulation technique for a low-noise high-gain RF wideband amplifier". Central European Journal of Engineering. 2 (3): 383–391. Bibcode:2012CEJE....2..383R. doi:10.2478/s13531-012-0009-1. ↑ "Understanding Amplifier Operating "Classes"". electronicdesign.com. Retrieved 2016-06-20. 1 2 "Amplifier classes". www.duncanamps.com. Retrieved 2016-06-20. 1 2 "Amplifier Efficiency". sound.westhost.com. Retrieved 2016-06-20. ↑ "Biasing Op-Amps into Class A". tangentsoft.net. Retrieved 2016-06-20. ↑ "Class B Amplifier - Class-B Transistor Amplifier Tutorial". Basic Electronics Tutorials. 2013-07-25. Retrieved 2016-06-20. ↑ "Class AB Power Amplifiers". www.learnabout-electronics.org. Retrieved 2016-06-20. ↑ "Class C power amplifier circuit diagram and theory. Output characteristics DC load line". www.circuitstoday.com. Retrieved 2016-06-20. ↑ A.P. Malvino, Electronic Principles (2nd Ed.1979. ISBN 0-07-039867-4) p.299. ↑ "Class D Amplifiers: Fundamentals of Operation and Recent Developments - Application Note - Maxim". www.maximintegrated.com. Retrieved 2016-06-20. ↑ Malina, Roger. "Visual Art, Sound, Music and Technology". ↑ Shortess, George. "Interactive Sound Installations Using Microcomputers". JSTOR 1578331. Wikimedia Commons has media related to Electronic amplifiers.